First operationalized in 1975, the road-mobile Scarab-A variant was designed to be deployed alongside conventional forces, maintain flexibility on the battlefield, and attack tactical targets such as bridges, storage facilities, troop concentrations, and airfields. It is a single-stage, single warhead, solid-fueled battlefield short-range ballistic missile (BSRBM) with a range of 70 km and inertial guidance to achieve an accuracy of 150 m Circular Error Probable (CEP). It has a 482 kg warhead that can be equipped with conventional, chemical, or nuclear munitions; the nuclear warhead is believed to have a selectable yield of 10 or 100 kT. If fitted with fragmentation or submunition conventional warheads, the Scarab’s blast radius is increased increasing its lethality against military units and troop concentrations. The missile can also be fitted with an Electromagnetic Pulse (EMP) warhead that can be calibrated for air burst to maximize effectiveness. The missile has been proliferated to numerous Warsaw Pact countries and former Soviet allies. According to the Russian RIA news agency, the conventionally-equipped Scarab has been employed a total of 60 times in combat. Ukraine is believed to possess around 500 Scarab missiles and has purportedly exported the Russian BSRBM to countries such as Syria and Yemen. 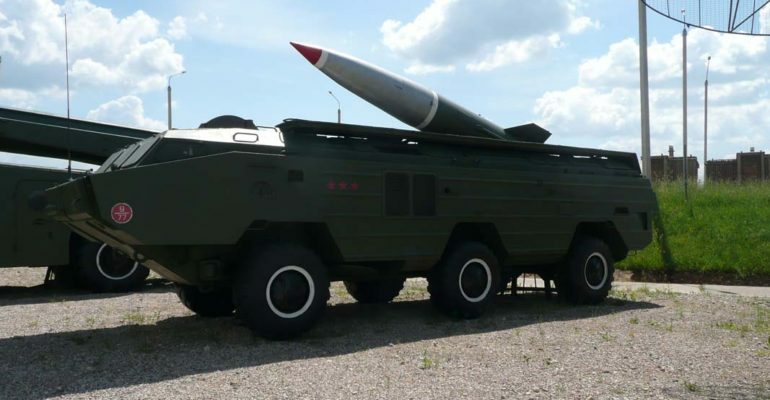 Reports speculate that Syria received around 40 Scarab BSRBMs and 12 corresponding TEL vehicles from Ukraine. In the mid-1990s, Syria provided North Korea with a Scarab-A prototype, which the Koreans reverse engineered and domestically produced and deployed as the KN-02 BSRBM. Yemen was also a recipient of the Scarab, obtaining an estimated 40 missiles from Ukraine. In December 2015, Houthi rebels in Yemen used the Scarab to carry out devastating strikes on the Arab coalition operating within the country, killing hundreds. Armenia, Belarus, and Kazakhstan are also believed to be in possession of the Scarab. February 6-8, 2017: Russia supplied Bashar al-Assad in Syria with 50 Tochka missiles. November 9, 2015: The Tochka-U was deployed to Southern Russia for military drills. August 8-11, 2008: At least 15 Tochka missiles were deployed by Russian forces during the South Ossetia war with Georgia. October 1999: U.S. satellites tracked two Russian BSRBMs fired into the Chechen city of Gronzy, killing 143. Intelligence reports speculate that the missiles were Scarabs. 1999: The first refit flight test of a Scarab-B. 1996: Life extension program for the Scarab-B was started to add another 10 years to the missile’s original 15-year service life. “Tochka-U Missile System to Deploy to Southern Russia for Drills,” Sputnik. http://sputniknews.com/russia/20150911/1026865958/russia-drills-missile-systems-deployment.html. “OTR-21A/-21B (SS-21),” Missile Threat. http://missilethreat.com/missiles/otr-21a-21b-ss-21/. Sabak, Juliusz. “Russia: Iskander System Replaces the Tochka Missiles,” Defense 24. http://www.defence24.com/300494,russia-iskander-system-replaces-the-tochka-missiles. Novosti, Ria. “Russia Tests Tochka-U SRBM in Siberia,” Missile Threat. http://missilethreat.com/russia-tests-tochka-u-srbm-in-siberia/. Binnie, Jeremy. “Analysis: Arab coalition reportedly hit by second Tochka missile attack in Yemen,” IHS Jane’s 360. http://www.janes.com/article/56688/analysis-arab-coalition-reportedly-hit-by-second-tochka-missile-attack-in-yemen. Novosti, Ria. “Russia: SS-21 Scarab Missiles Test Fired,” Missile Threat. missilethreat.com/russia-ss-21-scarab-missiles-test-fired/.